There was a time when certain bodily functions were off-limits in polite conversation. But we've become a society that reads "Everybody Poops" to their children. The "pee tape" factors in the political dialogue. Social media's "poop" emoji was a prominent character in a recent kids' film. So maybe it's time for a blunt conversation about the quality of water in your local public swimming pool, and what you can do to make it less gross. "How much pee is in that pool?" So I set out to find answers. Some people swim in blissful denial. Like Tiffany Forster. I met her at the Belmont Pool in Long Beach. Forster said she personally wouldn't do it. "Never," she said. "Absolutely never." "I try not to think about it. I just hope they don't," she said. At the other extreme, swimming in the same water, I found the Wilson High School Water Polo team. You might describe them as pee-forward. I asked the team, en masse, if real swimmers pee in the pool. The response was near-unanimous: "yes!" SO, THERE IS PEE IN THE POOL. HOW MUCH? Science gives us an answer. Purdue University scientist Ernest Blatchley III, co-authored a 2014 study of the water during a national swim meet. These are elite swimmers who may spend hours in the pool each day with coaches who discourage taking a break. "We were able to estimate that each swimmer deposits somewhere between 50 and 100 milliliters of urine every time they jump in the pool, which is about the size of a shot glass," Blatchley said. He's a former competitive swimmer himself — and he gets it; there's a culture on swim teams that says it's OK. But he says it should be as uncool as second-hand smoke. "When you pee in a pool, it affects you and the people around you. So you could call it second-hand urine," he said. BUT THE CHLORINE TAKES CARE OF IT, RIGHT? Bad news. Don't count on it. The Centers for Disease Control says peeing in chlorinated pools is a problem for a host of reasons. Urine mixed with chlorine can create a chemical irritant that causes red, stinging eyes for swimmers. Also contaminated pool water can cause skin rashes, earaches and breathing problems. And you probably knew this, but poop is even worse. 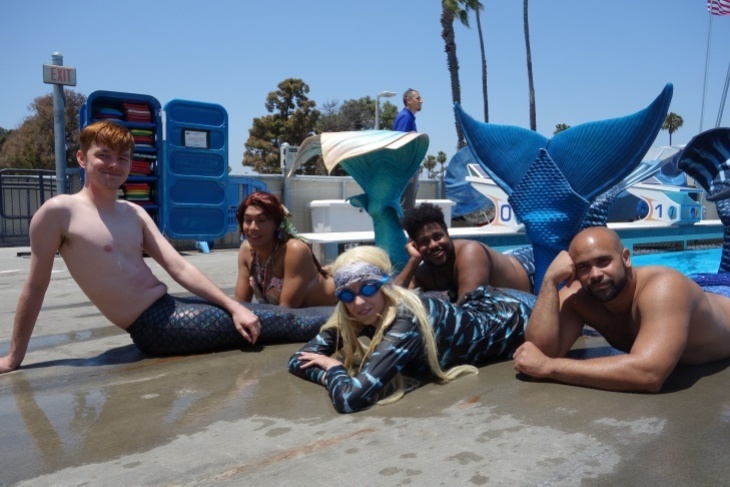 A couple years ago, the CDC tried to get people to be serious about the risk of diarrhea in public pools. They made this video spoofing cops busting a guy who puts everyone in the pool at risk. It is true that chlorine kills most germs, but a chlorine-resistant parasite known as Cryptosporidium can survive for days in a chlorinated pool. NOW I'M WORRIED. WHAT'S BEING DONE TO KEEP POOLS CLEAN? Pool operators are the first line of defense against nasty germs in the water. Close behind are the inspectors who visit all sorts of public pools. It's not just the big-city pools that get scrutinized. Hotels, health clubs, apartment and condo buildings with four or more units, schools, church camps, really any pool that's not an ordinary backyard pool. They also inspect water playgrounds like the sort that shopping malls put outdoors for kids to splash in. And those inspections cover a range of safety issues, not just how clean (or dirty) the water is. 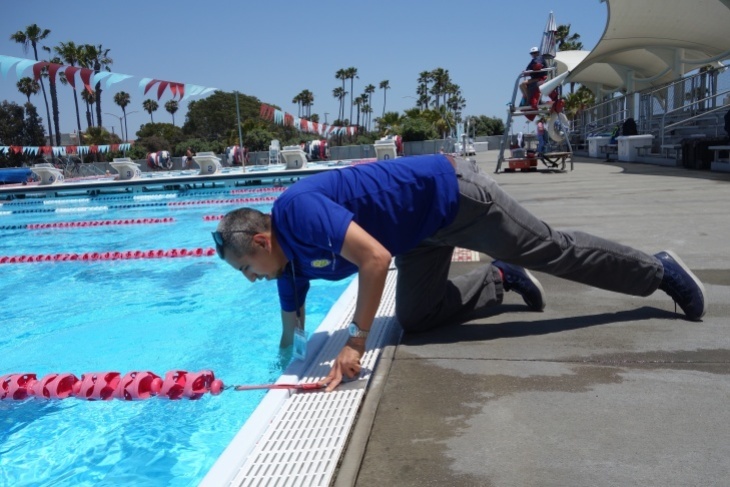 At the Belmont Pool earlier this summer, Juan Garcia began an inspection by checking to make sure gates self-latch, ladders were sturdy and all the signage was correct. Garcia, who works for the Long Beach Environmental Health Department, also routinely checks to see that the pumps are circulating at the right pressure. A public pool has to filter all its water every six hours. A playground splash pad must re-circulate and filter its water every thirty minutes. Testing chlorine levels is key. "It's going to determine if we're going to close or if we're going to allow that to stay open," Garcia said. He dips a testing flask about elbow deep into the pool at a location that is farthest away from the water flow jets and intake valves. That's where the water is likely to be least clean. "I usually like to take my water sample from the deepest part of the pool," he explained. That's because there needs to be chlorine in the water to bind to any bad stuff no matter where in the pool you are swimming. Garcia says one person can use up the entire chlorine in a body of water within minutes. How? Well, it's not just pee that uses up chlorine. There's a reason for those signs that instruct you to shower before getting in the pool. Lotions, creams and cosmetics all diminish the effectiveness of chlorine. Even that t-shirt you have on to avoid burned shoulders is a menace. That's why most public pools require you to wear a real swimsuit, not cutoff jeans or other street clothes. Chlorine binds to cotton fabric, making less chlorine available in the pool to kill germs. But even Garcia concedes the shower-first mandate is widely ignored. "That's that's a tough one," he said. "That's one that's hard to enforce." In case it isn't already clear, you obviously shouldn't pee in the pool. You also shouldn't be swimming if you've recently had diarrhea. Keep in mind not everyone is following the rules. Avoid getting pool or hot tub water in your mouth. Parents should supervise kids in the pool and make sure they get out at least once an hour to use the restroom. Here's where to worry: Hotel pools, hot tubs and kiddie interactive splash playgrounds have the most problems, according to a recent CDC report. Keep in mind that, while rare, serious illnesses stemming from pools do happen. Cryptosporidium and Giardia are the most common illnesses. E Coli, too, on occasion. The CDC reported eight deaths and more than 27,000 cases of illnesses tied to recreational bodies of treated water, including pools, from 2004 through 2014. Sometimes entire groups of people get ill at the same time. The CDC counted nearly 500 multi-victim outbreaks of illnesses over the 10-year period, many from hotel pools and hot tubs. HOW DO I KNOW HOW CLEAN MY LOCAL POOL IS? Much of the data is online and searchable. 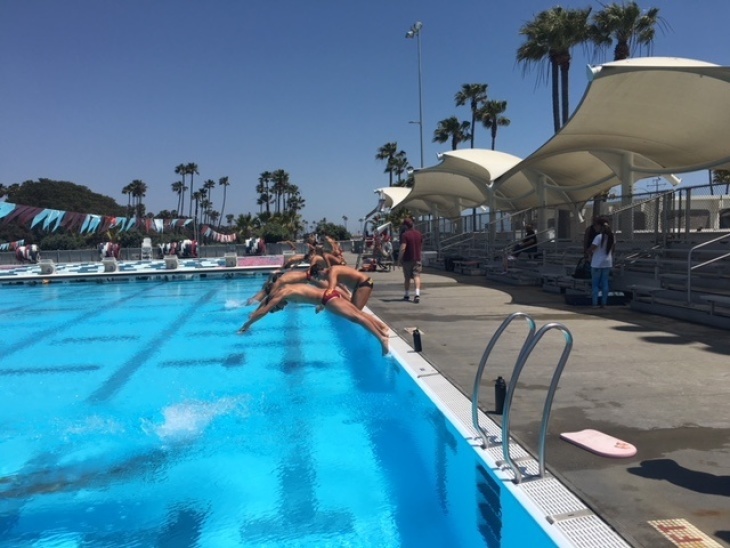 Los Angeles County already has a website for inspections, violations and closure information for more than 15,000 other pools that county Public Health inspectors review. That includes the pool at your health club, school, apartment building or condo. Shopping center splash pads, too. Orange County will respond to phone-in requests for pool inspection reports. A version of this story aired on KPCC. Listen here.